Peter Fonda and Dennis Hopper revved up their motorcycles and, like Jack Kerouac, inspired a generation of young people to hit the road. Since Easy Rider is the film that is said finally to separate the men from the boys – at a time when the generation gap has placed a stigma on being a man – I want to point out that those who make heroes of Wyatt and Billy (played by Peter Fonda and Dennis Hopper) have a reasonably acrid dose to swallow at the start of the picture. Wyatt and Billy (names borrowed from the fumigated memory of the two outlaws of the Old West) make the bankroll on which they hope to live a life of easy-riding freedom by smuggling a considerable quantity of heroin across from Mexico and selling it to a nutty looking addict in a goon-chauffered Rolls Royce. Pulling off one big job and thereafter living in virtuous indolence is a fairly common dream of criminals, and dope peddling is a particularly unappetizing way of doing it. Is it thought O.K. on the other side of the gap, to buy freedom at that price? If so, grooving youth has a wealth of conscience to spend. Clearly the makers of the film think it O.K., and they are Fonda, Hopper and Terry Southern, the very knowing, if no longer very young, trio who in various combinations wrote, directed and produced. Wyatt and Billy are presented as attractive and enviable; gentle, courteous, peaceable, sliding through the heroic Western landscape on their luxurious touring motorcycles (with the swag hidden in one of the gas tanks). It is true that they come to a bloody end, gunned down by a couple of Southen rednecks for their long hair. But it is not retribution; indeed, they might have passed safely if the cretins in the pickup truck had realized that they were big traders on holiday. And another question I would like to shout across the gap is why, if these two are so freely doing their thing, they are so morose about it. They seem crushed speechless by melancholy, and though I Understand that taciturnity is the preferred style – each initiate being absorbed in his private secretions – I noticed that Wyatt and Billy came at least wanly to life when they picked up a rebellious and alcoholic young lawyer in a crossroads town (Jack Nicholson). His imagination, wit, curiosity and love of life seem effervescent (and he is only the rich-boy drunk of a very small town) by contrast with the flat impassivity of the others. It is true that every night over their campfire Wyatt and Billy smoke pot, achieving thus a sudden irrational loquacity, accompanied by inane giggles. They pity friend George for his addiction to booze. But, so the script goes by these knowing men, when George is sober he is wide awake, when the other two are not high they are merely low, if indeed not half asleep. It may only be coincidence, and marijuana may yet be recognized as the cure for what ails us all, but the demeanor of Wyatt and Billy does not seem to prove the point. I should say something of the picture. It is a beautiful evocation of America as a ribbon of road through magic lands. The scene unreels like a silky, hypnotic dream, because the odd effect of the strident rock and roll that blares from the sound track is to make the action seem wrapped in eerie silence. And the two men look like fair warning, outriders of apocalypse, as they glide past in their schizoid costumes (one dresses to hide oneself in fantasy) on their indolently powerful mantis-like bikes. There is a beautifully sustained episode of suspended animation at a hippie commune, where again the air is gentled by pot, all human relationships seem easy and entertainers of abysmal incompetence absorb the benevolence of the chemically pleased. The tragedy is that these young have escaped from something genuinely destructive into something that is only an illusion of new birth. Americans are forever bruising themselves on utopia; now it is the turn of the flower children. Once it reaches its destination, New Orleans, the picture falters, losing its momentum in a sequence of innocent larking with a pair of girls from the town’s finest bordello that suggests the film makers know more about motorcycle vagrancy than they do about the customs and manners of prostitution. There is also another of those strobe-and-free-association passages that attempt to approximate the subjective effects of LSD and succeed only in producing headaches. And then follows quickly the concluding outburst of hate, really a repetition, since drunken George had died earlier in an encounter with the locals. The hate is that of Fonda, Hopper and Southern, they hate the element in American life that tries to destroy anyone who fails to conform, who demands to ride free. And it is quite right that they should. But Wyatt and Billy are more rigidly conformist, their life more narrowly obsessive than that of any broker’s clerk on the nine to five. The ads say they went looking for America and never found it, but what they really went looking for was freedom, and of course they never found it. 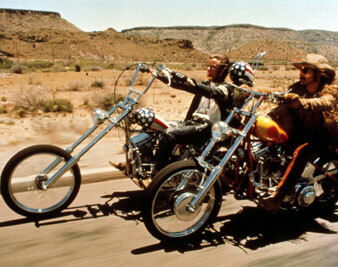 Which is what Easy Rider seems to mean on my side of the generation gap. But I would rather know what it means to those on the other side, who stand in block-long lines all day and all night to see Wyatt and Billy, those cosmetic derivations from American myth.